Although the Oscar nominated Canadian short ‘I Met The Walrus’ didn’t take home any hardware at last nights Academy Awards, the 6-minute film got its world television premiere on the CTV network following the gala. 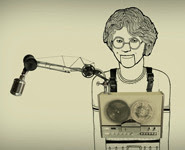 The animated short film follows a 1969 tape-recorded interview by 14-year-old Jerry Levitan, a Beatles fan who somehow ended up in John Lennon’s suite at the King Edward Hotel in downtown Toronto, during the famed “Bed-In for Peace” campaign. After almost 40 years of refusing many offers for the original audiotape Levitan finally agreed to put it to use for an animation project after being approached by Toronto director Josh Raskin. The production was made possible by a $20,000 grant from BRAVO/FACT (Foundation to Assist Canadian Talent) and features Canadian animator Alex Kurina and illustrator James Braithwaite. ‘I Met The Walrus’ was a contender in the Best Animated Short category and was favoured to take home the prestigious statuette, but lost to the Polish-British adaptation of ‘Peter and the Wolf’.